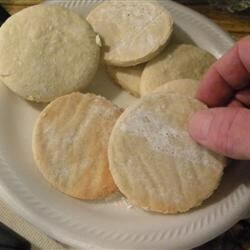 "This crisp little sugar cookie is a family recipe from the island of St. Michael in the Azores." In a medium bowl, stir together the cornstarch and white sugar. Add the butter and cream well. Add eggs, one at a time, mixing well after each addition. Combine the flour and baking powder; stir into the sugar mixture until a dough forms. On a lightly floured surface, roll the dough out to 1/4 inch thickness and cut into desired shapes with cookie cutters. Place cookies 1 inch apart onto an unprepared cookie sheet. Bake for 8 to 10 minutes in the preheated oven, until cookies are golden brown at the edges. Allow cookies to cool on baking sheet for 5 minutes before removing to a wire rack to cool completely. The perfect gluten-free cookie for dunking in coffee or tea. A great cookie recipe, simple and good flavor. Everyone that trys one has good comments on it. Thanks for the recipe. This is a great recipe. I made them smaller by cutting them into medicine cups. I loved them. They were a hit!!! made them and did not come out.had as a rock and to taste. did not wat to roll out.